Without airing all my dirty laundry I need to raise the level of security on my Android devices. 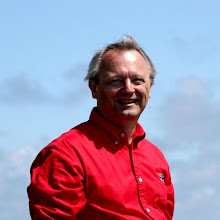 At the same time I want to minimize the burden when I am in a "friendly" place like my home, car or office. What I found was AutomateIT. It's free in the Play Store. There's also a Pro version. There was a good article on Lifehack that described how to use it. AutomateIT comes with a starter set of rules. I just turned all of them off. I created several pairs of rules. Each pair consisted of one rule that turned off the screen lock when I connected to a known network (Wi-Fi at home or office or BlueTooth in the car) and a complementary rule that turned the screen lock on when I disconnected from a known network. Here's what my rules look like. 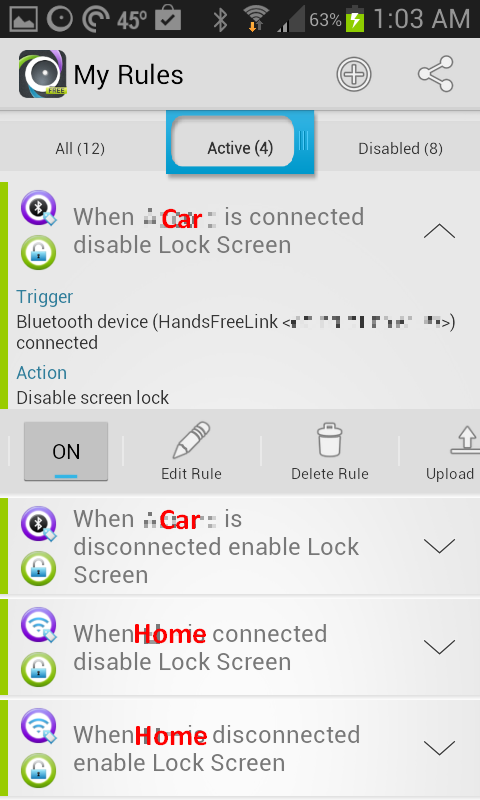 Editing the "When (car) is connected disable Lock Screen." It is set to trigger when it connects to my car's BlueTooth. 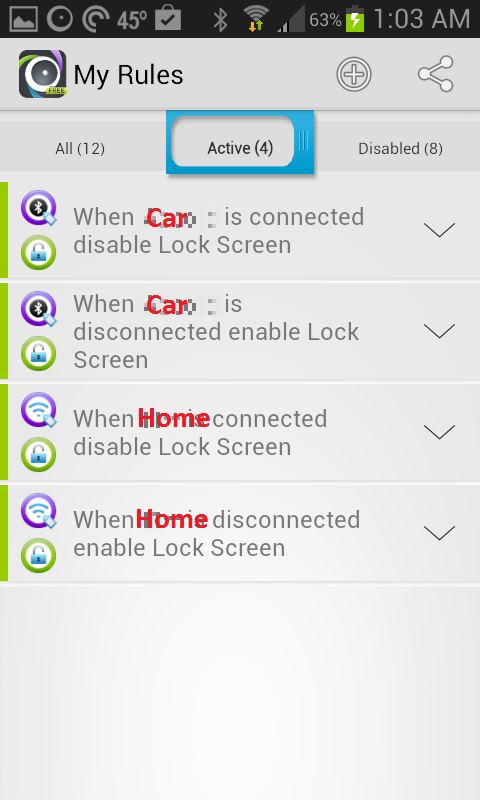 Then the action is to disable the screen lock. Notice that the Action to "Enable/Disable Screen Lock" is the same and you specify whether to enable or disable with a check box. Odd but works fine. It reads bottom to top. Let's start with the earliest full entry. 12:41:14 When (car) is connected disable Lock Screen - I started the car to drive to work. So it unlocks the screen. 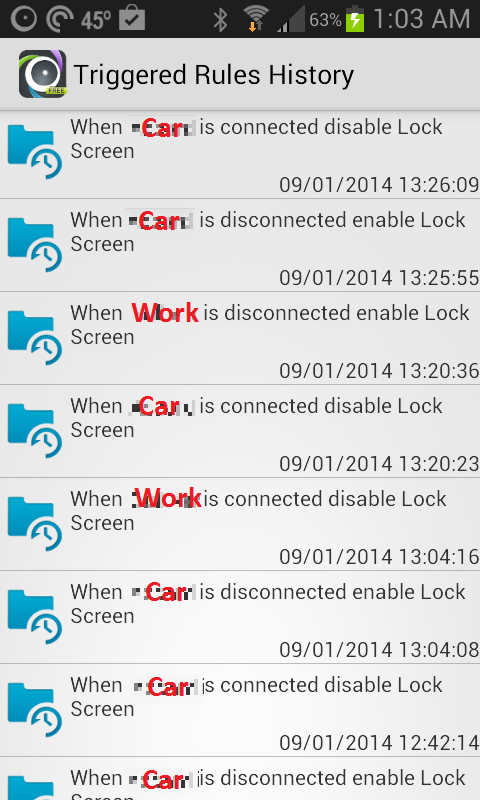 13:04:08 When (car) is disconnected enable Lock Screen - I get to work and turn off the car. So it locks the screen. 13:04:16 When (work) is connected disable Lock Screen - I walked into the office. 13:20:23 When (car) is connected disable Lock Screen - I started the car to leave work. So it unlocks the screen. But wait. It was already unlocked. 13:20:36 When (work) is disconnected enable Lock Screen - I drove out of range of work's Wi-Fi. So it locks the screen. But I'm in the car! The next 2 entries are where I disabled the BlueTooth on the phone to try to get back in sync. This really isn't a fault with AutomateIT. Perhaps AutomateIT Pro with composite triggers and composite actions can address this but it's going to get messy. There's another situation that isn't the fault of AutomateIT. Often when AutomateIT toggles the screen lock, Android leaves the screen on. It locks it for touch but leaves the light on. To use the screen you have to tap the Power button to wake it up. I'm undecided whether I'm going to stick with it.